All the info on Bethesda and MachineGames’ riotous sequel to The New Order. Wolfenstein 2: The New Colossus, the direct sequel to 2014’s The New Order, is coming from Bethesda and MachineGames. Once again stepping into the shoes of hero BJ Blazkowicz, Wolfenstein 2 takes the fight to a Nazi-controlled America. We’ll regularly update this page with everything you need to know about Wolfenstein 2, including the Wolfenstein 2 release date, pre-order details and gameplay info. Bethesda has announced that Wolfenstein 2: The New Colossus release date is October 27, 2017 (that’s a week before Call of Duty WW2 for those that care about such things). The game will be releasing on PlayStation 4, Xbox One, and PC. Award-winning development team MachineGames is once again at the helm, carrying on the work it did on Wolfenstein: The New Order and smaller follow-up The Old Blood. Wolfenstein 2 sees BJ entering a Nazi-controlled America in 1961, where he’ll fight to set the world free from the evil empire. In the trailer just below, Nintendo announced in their Nintendo Direct for September 2017 that both Doom and Wolfenstein: The New Colossus will be arriving on the Nintendo Switch. Wolfenstein will be releasing at some point in 2018, meaning it'll be released for the Switch after the PS4, Xbox One, and PC versions of the game, which are releasing on October 27, 2017. Our sister site Eurogamer recently went hands-on with Wolfenstein: The New Colossus at a special preview event, and came out with well over an hours worth of brand new gameplay, including an extended look at the wheelchair section of the game, which you can see just below. In the second, longer gameplay video below, you can see B.J. Blazkowicz exploring Nazi-occupied Roswell, as well as stealing a train, and fighting a gigantic robot. A more recent trailer from Bethesda gives us a look into the world in which The New Colossus is set, showing us how children live in America under the rule of the Nazi Empire. The trailer doesn't show off any gameplay that we haven't seen before, but it does let us know how things are going in America since the end of the previous Wolfenstein game. The trailer below released for The New Colossus in mid September gives us another brief look at the characters and the setting of the game, but we can also catch a glipmse of some giant Nazi mechs roughly halfway through the trailer. These look like they'll be tough to take out, but luckily our protagonist B.J. Blazkowicz can duel wield most weapons. The Freedom Chronicles Season Pass will net you 4 episodes of DLC content, featuring other freedom fighters that are busy taking the fight to the Nazi Empire across America, while protagonist of the main game B.J. Blazkowicz is busy elsewhere. Wolfenstein: The New Order and The Old Blood were built on id Tech 5, but Wolfenstein 2 is being created using the more modern id Tech 6 - the same engine id used to create the gorgeous Doom 2016. In New Colossus, BJ will recruit resistance leaders to fight against the Nazis, across iconic locations such as Roswell, New Mexico, a flooded New Orleans, and a post-nuclear Manhattan. BJ will have an arsenal of new guns and abilities to use in his fight, as he takes on enemies including Nazi soldiers, cyborgs, and über soldiers. The lengthy reveal trailer, embedded above, also shows encounters with giant mechs, teleporting enemies, and a crocodile. Panzerhunde also return, but this time it seems BJ gets to ride a flame-breathing model. Weapons on offer for BJ include the Laserkraftwerk, the Dieselkraftwerk, advanced pistols, submachine guns, and hatchets. You’ll also be able to upgrade weapons and dual wield your favourites. Returning characters in Wolfenstein 2 include hero BJ, the now pregnant with BJ’s baby Anya Oliwa, and former squadmate Probst Wyatt III. Interestingly, Fergus Reid, BJ's former squad leader also appears in the trailer, which suggests something strange is going on with timelines - depending on a choice in The New order, either Wyatt or Fergus died! The main villain appears to be the rather unpleasant Frau Engel. On October 27. 2017 Bethesda will also release the Wolfenstein 2: The New Colossus Collector’s Edition, priced $99.99. 1/6 scale 12-inch action figure of William Joseph "BJ" Blazkowicz, packaged in a premium, 1960s-style box. BJ comes fully equipped to rally the Resistance and free America, with an arsenal of accessories including four high-powered guns, a hatchet, and his bomber jacket. 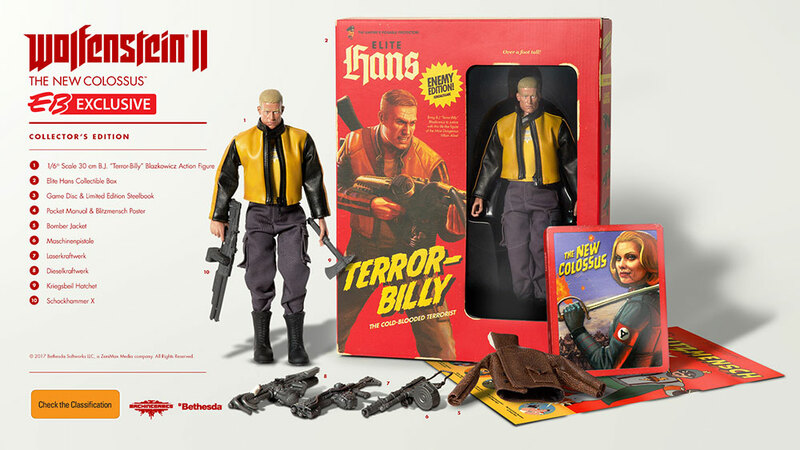 Pre-order Wolfenstein 2: The New Colossus Collector's Edition on PS4 or Xbox One. Check back for more info on Wolfenstein 2: The New Colossus as more details are released. B.J. Blazcowicz isn't held back by anything on-the-go.